What Does Trump’s State of the Union Mean for Foreign Policy? President Donald Trump delivered the annual State of the Union Address (SOTU) to a joint session of Congress on February 4 against the backdrop of severe partisanship. The 35-day government shutdown—which was the longest in American history and postponed the SOTU by a week as the address became a political football—guaranteed the speech would focus primarily on domestic policy. With Speaker Nancy Pelosi glaring down at him from her dais, Trump began and ended by calling for Congress to solve national problems in a bipartisan manner and asking Americans to choose “greatness.” While these addresses rarely focus on foreign policy, they lay out the administration’s priorities, and therefore can indicate major shifts and include some interesting points for our consideration. Though, the lack of specific foreign policy initiatives or priorities in this address speaks volumes. The speech’s most striking part on the surface had little to do with foreign policy but asserted that “we must be united at home to defeat our adversaries abroad.” However, in the context of divided government and potential investigations from both the Mueller probe and Congress, Trump issued an ominous declaration: “If there is going to be peace and legislation, there cannot be war and investigation.” Juxtaposing legislation and investigations with war and peace may not make sense abroad, but it sends a strong message that, as commander in chief, he determines America’s foreign policymaking in this administration, not his cabinet secretaries or the institutions they lead. State of the Unions are a particularly American and domestic spectacle full of pomp and symbolism that is often lost on those outside the country. Announcements about the next summit with North Korea’s Kim Jong-un on February 27 and 28 in Vietnam got little applause, as did Trump’s assertion that he prevented warfare on the Korean Peninsula. The president referenced a harder line on Iran and Venezuela, where regime change is now stated US policy, whereas he made more nuanced references to China and Russia. In many ways, the symbolism of President Trump’s guests—including World War II veterans, a Holocaust survivor, and his American liberator—provided the most powerful visual of America’s enduring foreign policy legacy. The president added, “No force in history has done more to advance the human condition than American freedom.” Despite this full-throated boast of American greatness, no other administration has been as skeptical about the country’s World War II inheritance or the international system that Washington has led. This juxtaposition between the president’s SOTU guests who point to American greatness precisely because of its leadership of the international order versus the administration’s skepticism of the very institutions that undergird this order has been a central thread running throughout the Trump administration’s foreign policy that has led to various tensions between the United States and its allies. Therefore, NATO members can take cold comfort in Trump citing them as an example of the US “getting other nations to pay their fair share” because they increased defense spending by $100 billion. Promising that America will never apologize for advancing its national interest, Trump used national security arguments more for his domestic than international agenda. Therefore, whether or not this SOTU has any lasting foreign policy implications will hinge on how well the next North Korea summit goes. However, it’s a safe bet that this SOTU will not be remembered for the specific words or initiatives announced, particularly on foreign policy. While many of President Trump’s most famous tweets are a more memorable and viral medium for his foreign policy pronouncements, the SOTU’s visuals and symbolism point to the source of America’s greatness in the world, which transcends any individual speech or president. Joshua W. Walker, PhD (@drjwalk) is Global Head of Strategic Initiatives and Japan at Eurasia Group, the world’s leading geopolitical risk consultancy, and a fellow at the German Marshall Fund’s Asia Program focused on Japan. 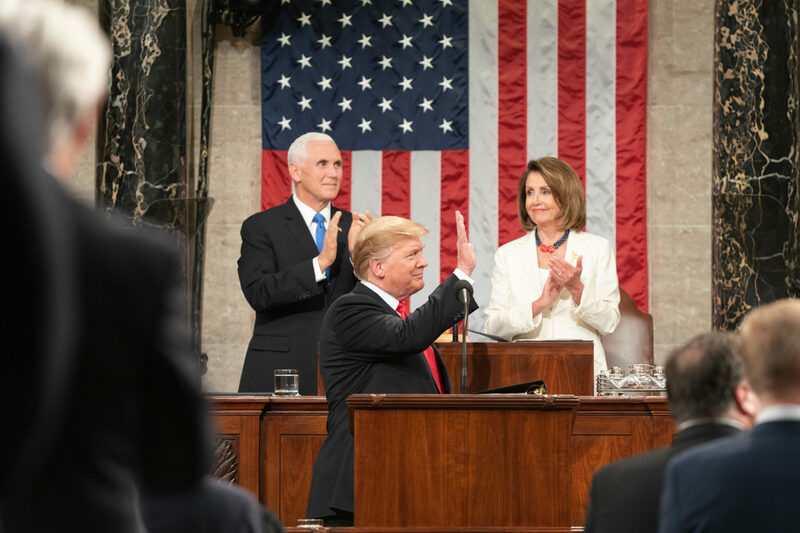 Photo Credit: President Donald J. Trump delivers his State of the Union address at the US Capitol, Tuesday, Feb. 5, 2019, in Washington, DC. Official White House Photo by Shealah Craighead.